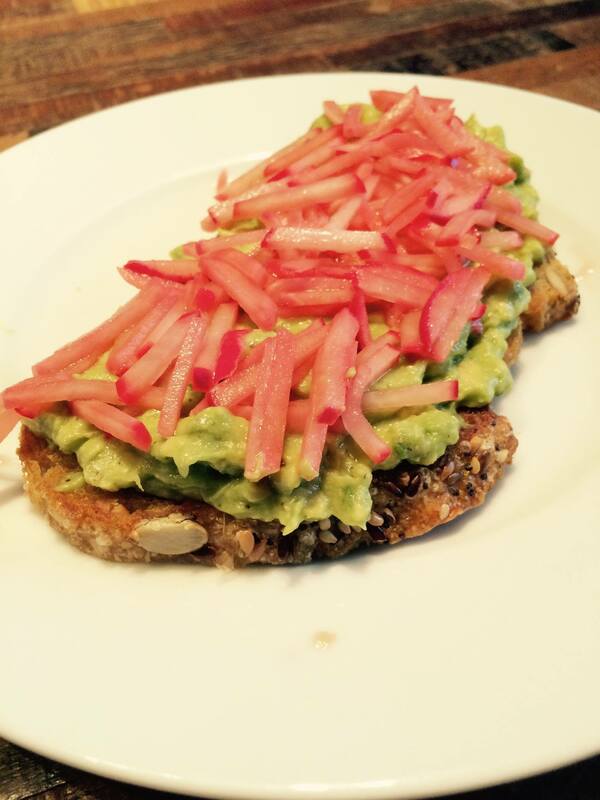 Mine’s been a take on Vernick’s avocado & spicy radish toast. I fry up a slice of Wegmans whole wheat bread, top it with half of a smashed avocado seasoned with TJ’s lemon pepper grinder, a little salt & a good squeeze of lemon juice & pickled radishes. It’s more than the sum of all of its parts. It is heaven on a plate. Unfortunately, I always have to step outside to open the container that holds the pickled radishes, b/c the smell is the worst. What is your latest culinary obsession? Huevos estrelladas. Thin slices of potatoes and onion are fried in olive oil until soft, then eggs are broken and dropped from a height onto the veggies and cooked until done to taste. It’s not a hash or scrambled eggs, it’s something deliciously in between. I like to fry up some padron peppers and chopped serrano ham in with the potatoes before the eggs get dropped on them. Boy, is this an incredibly simple but tasty dish. Lingua, your sandwich sounds like it hits all the flavours, almost like a veggie banh mi. I often throw in some julienned carrots with my pickled radishes. Stinky, sweet and spicy. Yum! That egg/potato/onion fry sounds great, too. Plus the ham! Perfect breakfast for hangovers. I’ve been making this super simple tahini miso sauce nonstop lately- i’ll put it on near anything but i think it’s best with raw veggies that need the flavor perk. Dunno about fermentation… I matchstick the radishes, then put them in a Talenti container along with a couple of splashes of apple cider vinegar & a generous shake of kosher salt. Mix them up, and off into the fridge they go. I made some steamed and some baked. had both with duck sauce on the side-yum! Aha. When i make them they’re gone within a few hours so they don’t develop a stank… I’m going to try your method with my next batch though! I use quite a few at a time (so I don’t run out), and they last a few days. They get stankier as time goes by.